So we have made the radical decision to attempt to grow all of our own food and begin a store free way of life. Knowing how challenging this will be for my family, but also for yours if you are trying this, I thought that updates and encouragement would be helpful. My garden is now a picture of growth! Almost all of my plants are in and thankfully many are already beginning to thrive. 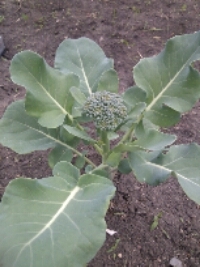 We have broccoli heads already developing, and blossoms on a few tomatoes. I hope this is just the beginning to a very productive year. I also blanched and froze my first two bags of asparagus yesterday so I’m feeling the excitement. Our biggest set back but also blessing so far has been the weather. Rain has been constant lately, those who live in the Seattle area you amaze me with your ability to handle this. When we did not have rain we experienced sunny weather with high temperatures and high humidity. Since my little guys cannot handle much of that, hour long projects in the garden is what my goal is daily. Our hopes for the store free winter are beginning to rise. Here’s hoping we all have full freezers and canning shelves this fall.